These are tables of congressional delegations from Missouri to the United States House of Representatives and the United States Senate. 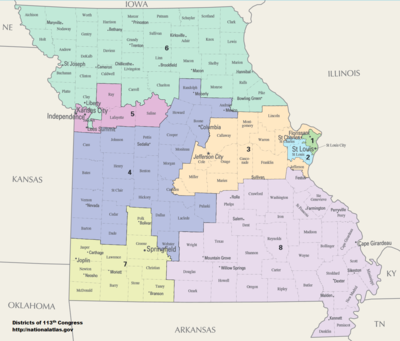 List of members of the Missourian United States House delegation, their terms in office, district boundaries, and the district political ratings according to the CPVI. The delegation has a total of 8 members, including 6 Republicans and 2 Democrats. Tables showing membership in the Missouri federal House delegation throughout history of statehood in the United States. On June 4, 1812, the Missouri Territory was created following the creation of the state of Louisiana. The Arkansas Territory was spun off in 1819. The state of Missouri was separated in 1821 and the remaining land was annexed by the Michigan Territory in 1834. Tables showing membership in the Missouri federal Senate delegation throughout history of statehood in the United States. As of January 2019[update], there are six former U.S. Senators from the U.S. State of Missouri who are currently living at this time, five from Class 1 and one from Class 3. This page was last edited on 19 February 2019, at 23:32 (UTC).